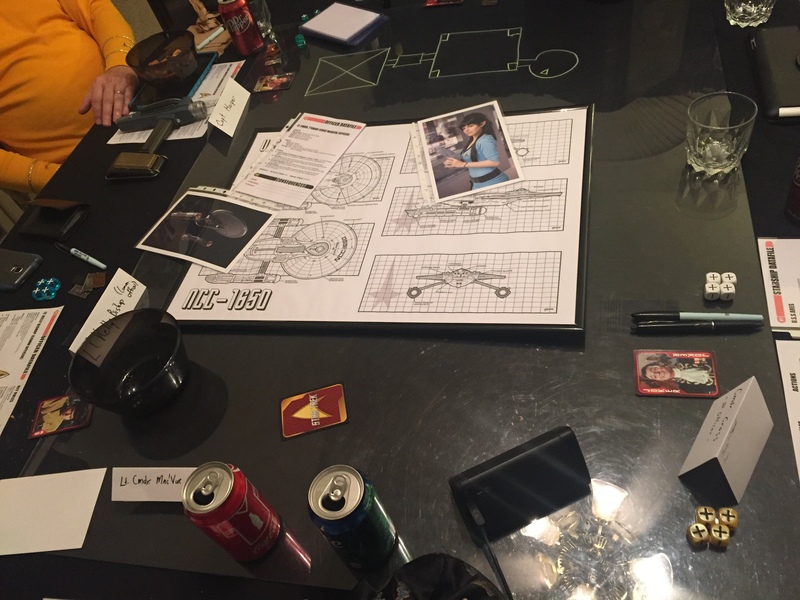 Last night’s Star Trek game was one of the most enjoyable games I’ve run in a long time! 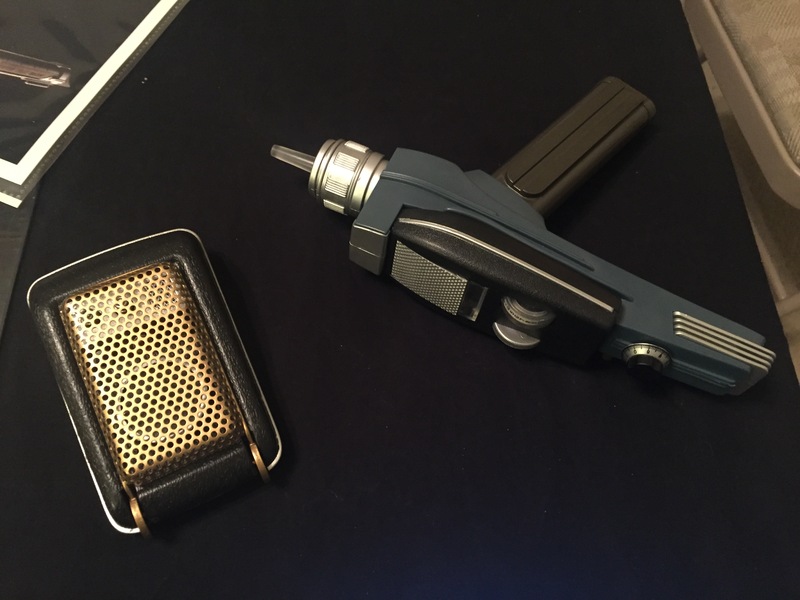 Partly it was my own love of the Star Trek setting, partly it was the enthusiasm of the players (notably Robert with his props and wardrobe), and partly it was the cinematic nature of the Fate RPG which I think was a great fit for this setting. 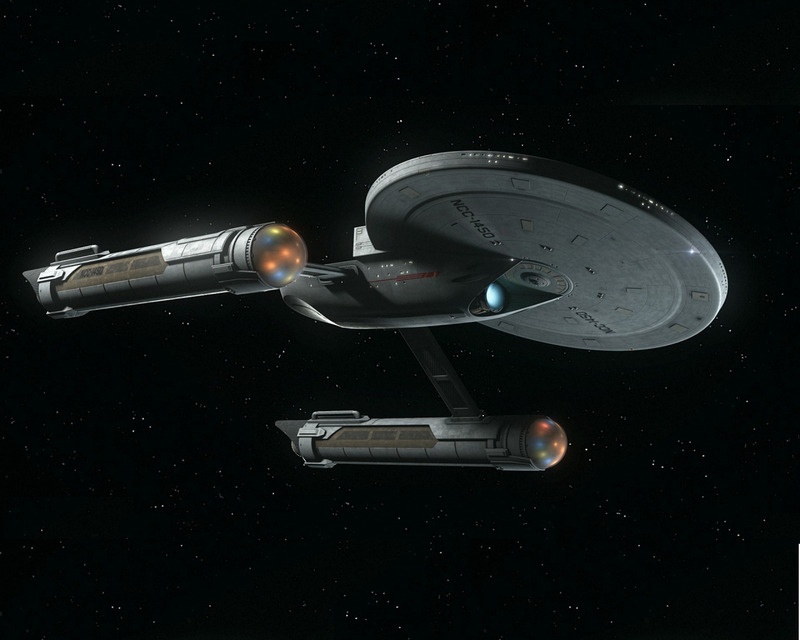 The story opened on Stardate 41661.7, where the U.S.S. Ares was exploring an uncharted system on the fringe of Federation space. Energy signatures indicated a recent battle. The crew of the Ares investigated and learned that a Human-looking peaceful race called the Coborati were attacked by a warlike neighboring species called the Bellani. The Bellani were 3 meters tall with soft features and elongated necks and limbs, led by a mysterious figure called “The Oracle” who was said to be their “God of War”. After a starship battle with the Bellani, chief medical officer Lt. Cmdr. T’shani, along with a few other crew, are captured by one the Bellani ships which then jumps to warp. The U.S.S. Ares then travels to the nearby planet Cobor. The Federation crew hatched a plan to use a captured Bellani scout ship to infiltrate the Bellani homeworld, rescue T’shani and her companions, and unravel the mystery of the God of War. Eventually, assisted by Bellani resistance fighters, the crew managed to insert themselves into the Bellani prison where T’shani and companions were held. The companions were then summoned to appear before The God of War. 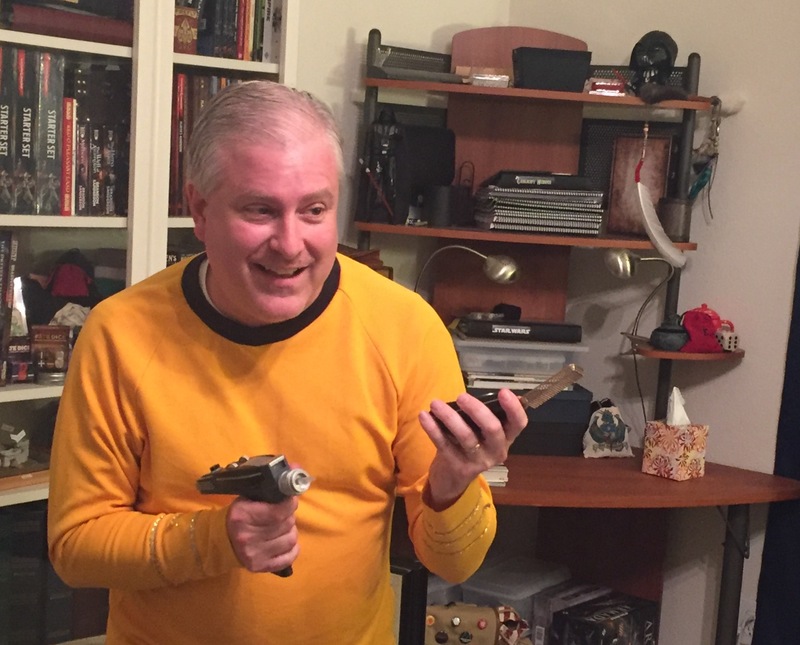 Obtaining their phasers smuggled in by the Bellani resistance fighters, Capt. Harper led a fight against The God of War. After sufficient taunting by the Federation crew, The God of War in his anger began to lose his shape. He was a Changeling, not a Bellani, who had duped the Bellani people for many years! As the fight ended, the Bellani government officials realized they had been deceived and renounced their erstwhile ‘god’ and entered negotiations to enter the Federation and forsake their warmongering ways. I’ll make a separate post on rules that we need to look up or master. The Starship rules worked well I think, with the Fate Fractal making it easy to run the combat using ships treated as characters. The ‘Shields’ house-rule letting you know ‘shields are at 94%!’ was a nice bit of flavor which mapped to the Stress boxes as you tracked damage. Robert was in great form doing a Shatner-style captain. I loved it! His props were second to none as well. Todd worked his ever-impressive Scottish accent for his engineering role. I was impressed with how quickly Martin picked up on the Fate rules. He slid into great, genre-specific roleplaying. Loved how his attempts at Empathy and negotiation served as the foil for the trigger-happy, Kirk-style Capt. Harper! 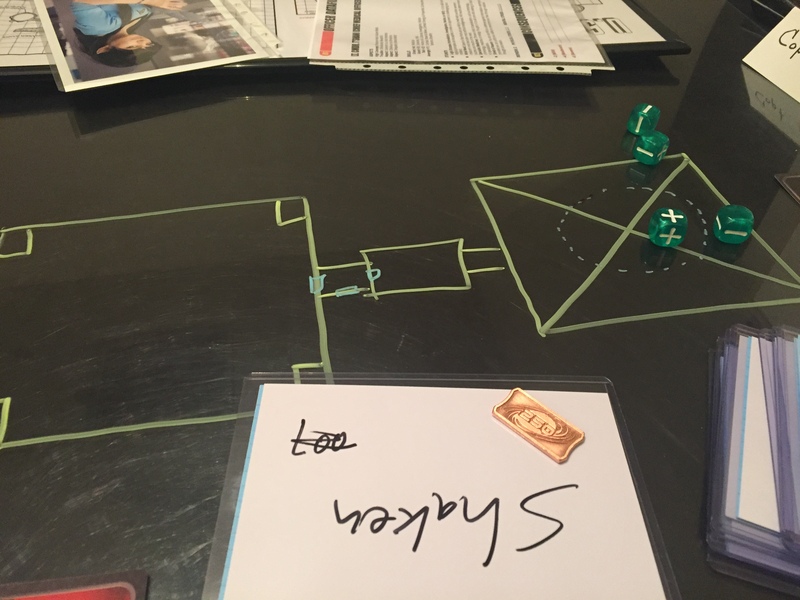 Visuals on the game table. Started using fluorescent markers on the plexiglass with no battlemat — works great to draw zones and not get distracted by Chessex grid mentality. Wow! Look at these props! They make noises and everything!